Welcome to Bond Street, home of elegance, sophistication, effortless style and unrivalled quality. 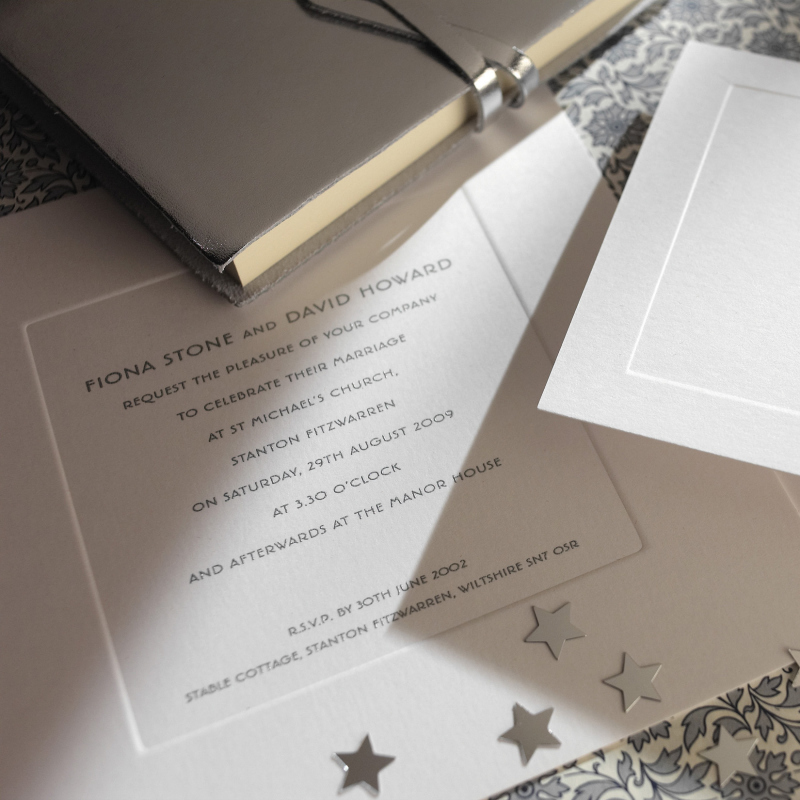 If gushy, bold designs are not your forte you’ll love this wedding invitation. Subtle and simple, these are the very reasons this design is so eye catching! This wedding invitation from The Letterpress of Cirencester is so adaptable, we’re sure it would be a fantastic addition to every wedding. We do think though, it would be super to invite your guests to a church wedding because it’s so incredibly classic in style and the white colour represents light, goodness, innocence and purity, amongst other things – perfect if you’re into your ‘meanings’! Its modern, clean style would equally lend itself well to a registry office wedding too! Bond Street is gorgeously simple. No frills, no fuss – it is what is and we ruddy well like it! But it’s not boring, oh no! The attractive silver raised ink that is used for the wording provides that stylish dimension, especially when it catches the light and glistens, and the 3D effect of the embossed plate sunk border on the heavy weight (600gsm) brilliant white woven 6” x 6” card creates a rather lovely ‘mounted’ feel, just like a posh painting! Hold it right there, we cannot just make a passing reference to the raised ink on this design because it sets it apart from other classic stationery of a similar design. The reason you don’t find raised ink on every design you come across is because it cannot be produced on your modern digital press. It needs wet ink to bond the special embossing powder which is melted into the ink. This is where the Letter Press of Cirencester excels… traditional techniques for traditional designs. You also have the option to choose as many or as few matching products in this range as you require, from a seating plan and reply cards to information sheets and plain place cards so that you can write your own messages/names – every little detail can be taken care of in style! Tags: Embossed, Plate Sunk, Simple.